This Wednesday I convened a public oversight roundtable to review and evaluate the District’s Certified Business Enterprise (CBE) program, the goal of which is to connect small & local businesses to D.C. government contracting opportunities. In order to make sure the CBE program is having its desired effect, the Council passed a law in 2005 requiring the Department of Small and Local Business Development (DSLBD) to submit a report every three years on the effectiveness of the CBE program. However, DSLBD has never actually produced the report and I have continued to push the agency to do just that. Over the summer, I held a series of Business Engagement Forums in each of the District's eight wards, engaging small business owners and aspiring entrepreneurs across the District. One consistent message I heard was that business owners want reassurance that the CBE Program is working for them. There are some very positive indicators about the program, since 2015, the District has reported record spending for businesses under the CBE Program and during that time the District has set a new record high number of CBEs, over 1,600. However, without a comprehensive assessment and evaluation of the CBE Program, it remains to be seen, if the program is in fact living up to its goal to connect small, local, and disadvantaged businesses with contracting and procurement opportunities. Small and local businesses contribute to the District of Columbia by bringing employment opportunities and innovation to our communities. They are the driving force of our economy. We must ensure that the District’s Certified Business Enterprise program is fulfilling its responsibilities to our businesses and residents. The changing economic environment in our city clearly shows that the cost of not evaluating the CBE program may be detrimental to our small businesses and residents. As Chair of the Committee on Business and Economic Development, I am committed to ensuring that all District of Columbia residents and businesses have equal opportunity to be a part of the economic prosperity in our great city. Early Voting Has Begun in D.C. The Local Communities Having Opportunities to Promote Equity (H.O.P.E.) Grant Fund Establishment Act of 2018 would establish the HOPE fund to be used to fund community priorities (including public safety initiatives, small business development, and capacity building initiatives) within designated qualified opportunity zones. As introduced, this legislation establishes an initial investment of $450,000 in seed funding and will be funded on an ongoing basis by directing 10% of enforcement penalties collected by the D.C. Department of Small and Local Business Development and directing .1% of sales taxes from designated qualified opportunity zones to the fund. The Small Business Bonding Program Establishment Amendment Act of 2018 establishes a program within the Department of Small and Local Business Development to provide training and technical assistance to eligible business owners to increase their bonding capacity. District of Columbia law requires contractors to obtain a performance and payment bond for certain contracts. Contractors work with sureties to ensure they are qualified to enter into the contract, often having their credit, capacity, financial standing, and character reviewed through a rigorous underwriting process. This legislation recognizes that while many Small Business Enterprises are more than capable of doing the work, many have historically struggled to provide the financial resources necessary to secure bonding or to increase their bonding limits to compete for higher dollar contracts. Coucilmember McDuffie attended the Grand Opening of the Village Cafe located at 1273 5th St NE. Among other resources, the team behind the Village Cafe received support from the D.C. Department of Local and Small Business Development (DSLBD) to start their new business. 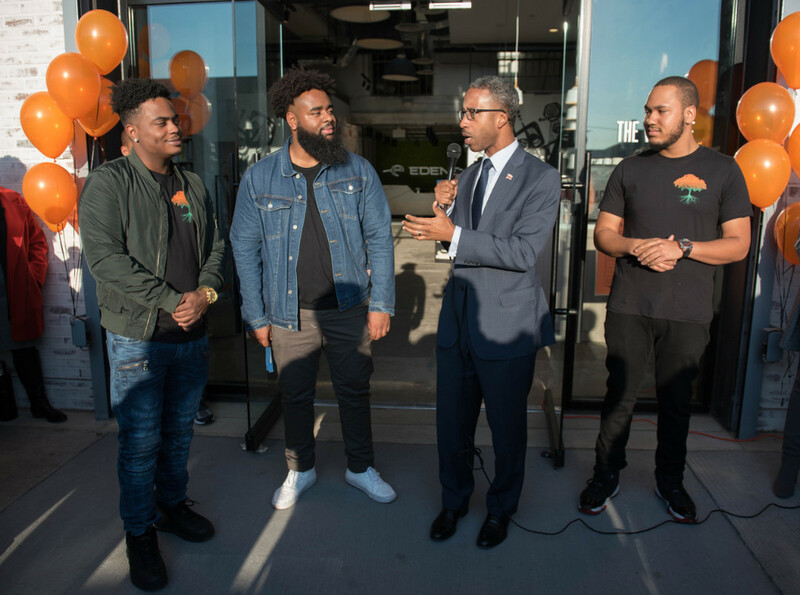 Just like Councilmember McDuffie, the founders, Kevon King, Ryan Williams, and Mahammad Mangum, are natives of Washington, D.C. and graduated from Wilson High School. Team McDuffie attended the Lamond-Riggs community meeting with DC Library to hear about the process for designing the new library and share their ideas about the role they would like the library to play in the community. CM McDuffie celebrated Ms. Pamela Stroman, who has lived in Ward 5 for over 50 years and many more in D.C., and 99 years young on October 22 - Happy Birthday! Team McDuffie attended a special Brookland Civic meeting at Tastemakers. 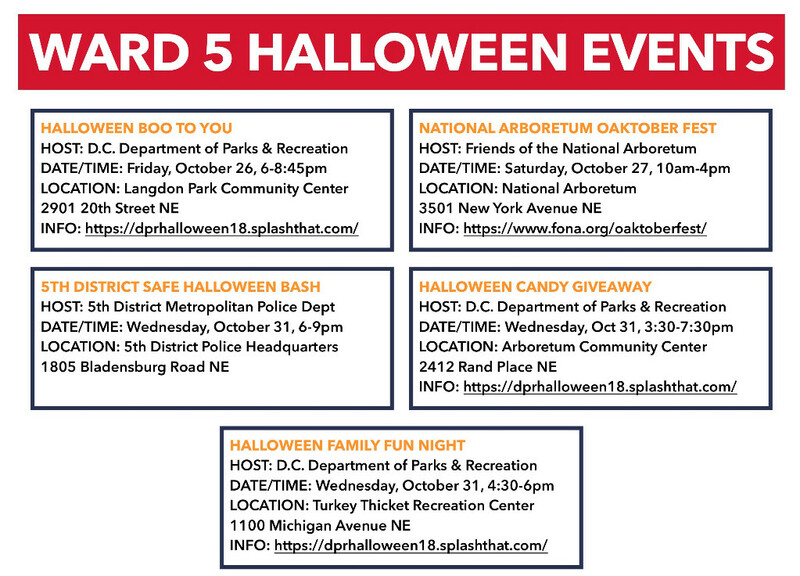 The District of Columbia Public Schools (DCPS) will convene a public budget hearing on Wednesday, November 7, 2018 from 6:00 - 8:00pm at Phelps Architecture, Construction and Engineering High School, 704 26th St NE, Washington, DC 20002. The purpose of the hearing is to gather input from the public about the upcoming Fiscal Year 2020 (School Year 2019-2020) budget. Members of the public are invited to provide testimony at the hearing. Individuals or groups wishing to testify should register online at http://bit.ly/DCPS2018BudgetHearing. Testimony will be limited to three minutes during the hearing. Witnesses should bring five (5) copies of their documentation, including a written copy of their testimony and any supplemental information. All documents will be included as part of the official record. Testimony sign-up will remain open until Monday, November 5 at 3 pm For questions or concerns, please contact the DCPS School Funding Team at (202) 442-5112 or dcps.schoolfunding@dc.gov. 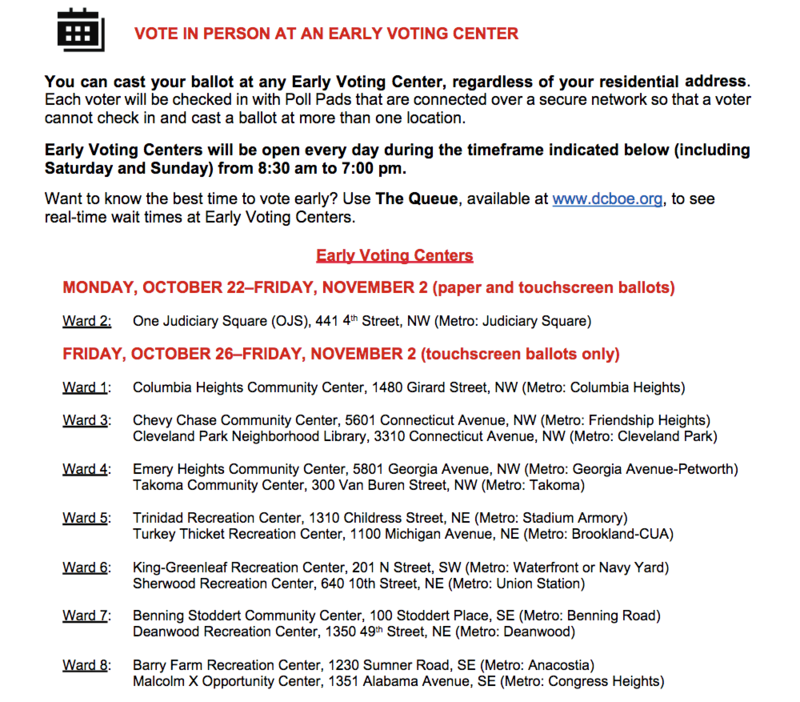 Please see the information below on early voting from the voter guide published by the D.C. Board of Elections.